The Infinity Money Booth is a great way for customers to notice you! For Trade shows, benefit gatherings, brat fry's, grand openings, customer appreciations, employee parties, and much more! The Infinity Money Booth will be completely setup by the time you specify and taken down by an attendant included with the booth. This is a booth rental service only, you provide the cash or other items to be won within the booth. Raise money for your benefit today, attract new customers, or show your employees your appreciation at your company party! 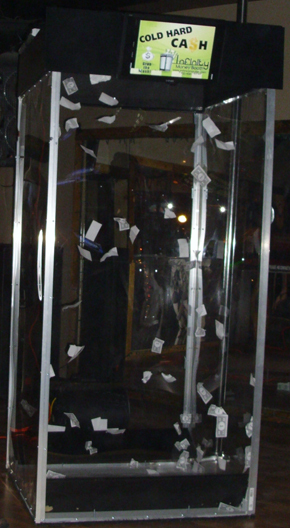 You simply put anything you would like to give away into the booth, Gift certificates, money, or any other paper. 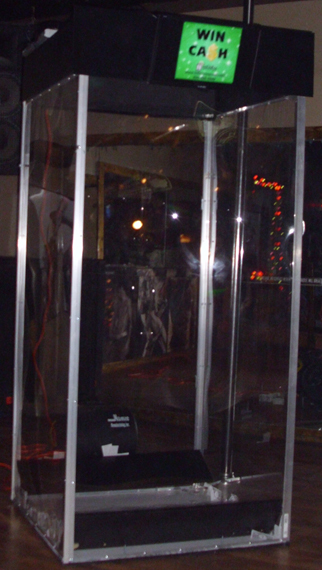 The booth is very affordable at a rental price of only $100 per hour, if you would like the booth setup before the time it is to be in use, the charge is only $25 per hour. If you wish for the booth to be setup after its time of use it is $25 per hour. 1 hour minimum for the booth rental.